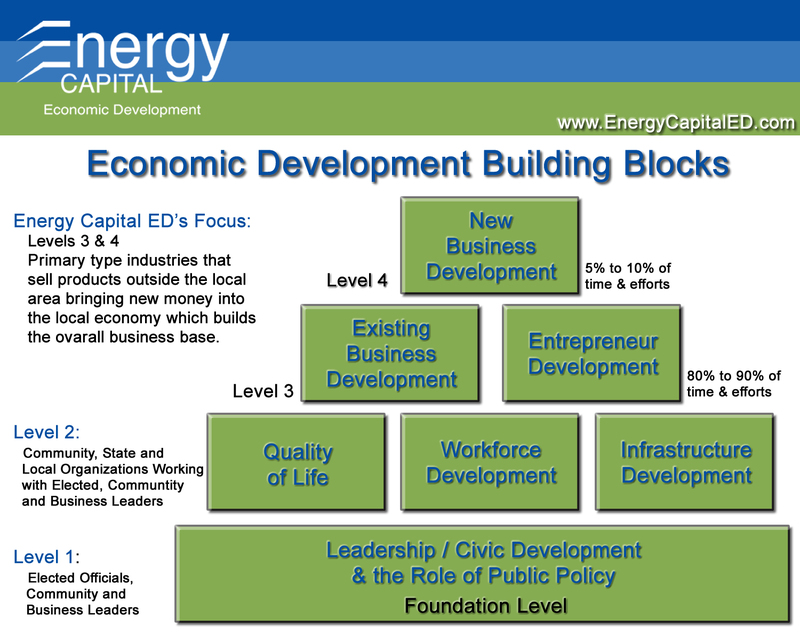 What is Economic Development? It can be different things to different communities. In Campbell County and Gillette we use the Building Blocks of Economic Development as a guide to help people understand what we do. Does it further diversify Campbell County’s economy? Does it build on existing strengths that Campbell County already has? 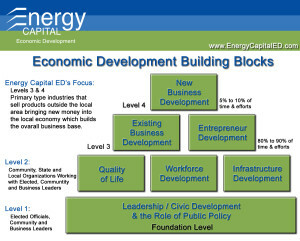 Economic development initiatives and policies have a higher chance for success if they build on existing fundamentals. Does it increase private investment in Campbell County? Investment in facilities, goods or services creates positive economic activity where those investments are made. Does it expand the tax base for state or local government? or facilities are expanded or new, taxable activity or transactions occur. Does it create new, quality jobs? New employment opportunities are created by attracting new employers, by expanding the employment of existing firms, and supporting start-up businesses. New jobs increase the demands on the labor force which generally increases wages and/or benefits across the board. New jobs should be above the local county average or an improvement to existing employment opportunities. Does it improve Wyoming’s competitiveness? Tax policies, incentives and governmental policies all have an impact on the viability of a business location in Wyoming versus other states. Policies should remove or reduce disadvantages of Wyoming vis-a-vis other locations. Does it create or expand public and/or private infrastructure? Access to transportation, water and sewer, data fiber, telecommunications, natural gas and electricity is fundamental for business to be able to create jobs and economic activity. Does it expand or diversify the workforce? A diverse and skilled workforce is critical to business and it is critical to the state to have businesses that require diverse skills and that create high-paying employment. Does it generate funds for state and local governments? It is important for local government to have the resources to meet citizens’ needs and provide for the common good. Those resources can flow from the State, local taxes and levies or be expanded by increased business investment and activity. Does it move toward more efficient and/or business-friendly government? Minimizing governmental barriers to constructive business and maximizing government responsiveness to business and citizens helps create an environment where business can prosper and citizens’ needs can be more effectively met.